Russia has succeeded in stopping a Libya-like scenario of western military intervention developing over Syria and this bodes well for the strengthening of the international system based on the UN Charter. On the face of it, a depressing picture emerges from the trilateral meeting on Syria held in Geneva on Friday between the envoys of Russia, the United States and the United Nations. The meeting reportedly failed to find a breakthrough and the judgment of most analysts is that a solution to the crisis in Syria could be a long time coming. But such diplomatic events often form the humble pie of a lengthy process and can be deceptively inconsequential. They need not be reduced to peremptory judgment, either. When a conflict situation lends itself to diplomatic engagement, that itself is a step forward. The fact is that Russia and the US have held two meetings in successive months regarding Syria. The glass is, so to speak, half full (and half empty) and it all depends on how one chooses to view the state of play. The meeting in Geneva ended without any practical deal to end the Syrian conflict, but there has been at the same time an important agreement ruling out any military solution to the conflict while upholding that the so-called Geneva communiqué of June 30, 2012 (which proposed a transitional government in Damascus comprising the Syrian authorities and the opposition forces) would form a good basis to reach a political solution. The Russian diplomacy can draw satisfaction that its core viewpoint has gained currency in the international community. Of course, this does not mean that the external interference in fomenting the conflict in Syria has ended but it has probably laid at rest whatever residual prospects still existed for a western military intervention in Syria. Qatar’s latest call for an Arab military expedition to Syria is unlikely to have any takers. Fortunately, Qatar has no army to match Syria’s, either. Indeed, the West may have attained some important geopolitical objectives already in the Syrian situation such as the deployment of the missile defence system under the NATO umbrella in Turkey (which would have implications for Russia and Iran) on the pretext of a possible threat from Damascus to Turkey’s security as well as the overall degradation of Syria as a military power (which would tilt the military balance in the region in favour of Israel) and indeed the overall weakening of ‘Arabism’ itself, taking into account the disarray in Iraq and Egypt as well (which would have broader implications for the Arab-Israeli conflict). Nonetheless, Russia has succeeded in stopping a Libya-like scenario of western military intervention developing over Syria and that by itself would have positive significance for the strengthening of the international system based on the United Nations Charter. Following the talks in Geneva, in media briefings, UN special envoy Lakhdar Brahimi pointed out that “it is the wider international community, but especially the members of the Security Council that can really create the opening that is necessary to start effectively solving the [Syrian] problem.” Brahimi is scheduled to brief the Security Council later this month. Conceivably, the 5-hour long parleys at Geneva on Friday would have gone into some details of the Syrian problem. This becomes evident from the fact that on the very next day, on Saturday, Russian Foreign Ministry has attempted to flesh out the steps needed in the coming period to initiate a political process. The statement in Moscow, while emphasizing that last June’s Geneva communiqué remains relevant as “the only platform” for overcoming the Syrian conflict, underlined that the “priority task is to stop all violence and bloodshed immediately”. In parallel to that, Moscow said, “it is necessary to launch a political transitional process in Syria aimed at formalizing legislatively guaranteed and equal rights for all ethnic and religious groups in that country.” The vague suggestion of an accord evocative of the Taif Agreement (1989) that brought the Lebanese civil war to a close and reorienting that country to the Arab world becomes interesting. Put plainly, Russia’s message is that first, any solution to be durable needs to be all-inclusive and broad-based, and, second, neither the big powers nor the regional states in the Middle East can be prescriptive toward Syria. 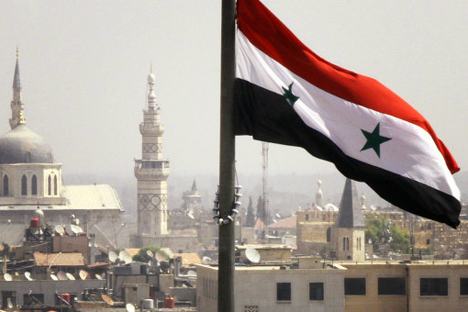 Taken together, the Russian stance amounts to a practical advice based on realism that the Syrian regime is as much a part of that country’s political economy as the exiles based in Paris or elsewhere or the rebel fighters and the country’s democratic opposition. These principles are no doubt extremely valid and the coming weeks will reveal the extent to which they find acceptance in the international community. A dramatic change on the part of the US need not be expected but having said that, there is also a renewed sense of urgency in Washington that Syria could become a ‘failed state’ unless an orderly transition process begins soon enough. Equally, while Qatar could be a maverick exception, there is growing unease in the countries surrounding Syria (such as Jordan or Turkey) about the beginnings of ‘jihadism’ in Syria. The Saudi-owned Al-Hayat newspaper recently featured a lengthy article titled “Jabhat al-Nusra’s Goals Extend Beyond Syria,” based on a speech made by Abu Muhammad al-Julani, the leader of the militant group in Syria (which has been named an al-Qaeda affiliate by Washington) in end-December. Julani’s speech unmistakably suggested that the so-called Free Syria Army, which is supported by the West and its regional allies, is being systematically sidelined. The Jabhat al-Nusra is gaining in popularity in Syria not only as a fighting force but also thanks to its disciplined cadres desisting from looting and other predatory behavior and instead behaving like neighbourhood groups by undertaking egalitarian justice and social services. The Russian warnings have been prescient that in the rush to bring about regime change in Syria, Washington shouldn’t fail to visualize the anarchy that might well follow the morning after. The singular success of the talks in Geneva on Friday could prove to be that the Security Council would deliberate on the issues of war and peace in Syria in a new chastened mood of sobriety and realism.